The FHB GIFAfloor is a 28 or 32mm thk calcium sulphate panel with a density of 1.500 kg/m3. The dimensions are 600 x 600 mm or 1.200 x 600 mm with a tongue and groove system that can be glued with a specific sealant. FHB GIFAfloor offers the possibility to quickly create a stable raised floor, supported by steel pedestals with an adjustable height. It’s the ideal product for the installation of loose-lay floors on top like ceramic tile, carpet and vinyl. 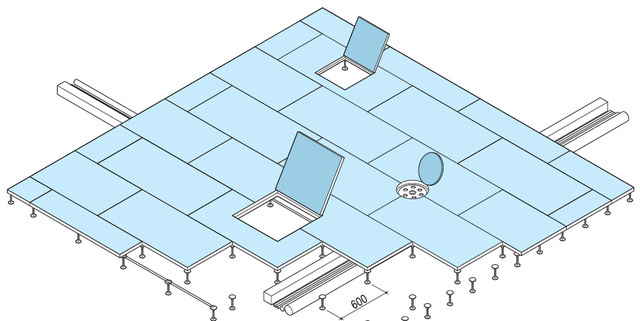 Newfloor suggests the installation of the loose-lay freefloor system. FHB GIFAfloor is the ideal solution for schools, hospitals, hotels, commercial and residential buildings, theatres and music halls. – Dental office – Rome – about 650 sqm (32 mm thk). How to choose the best raised flooring for your needs. We pay attention to the privacy and the correct management and conservation of personal data according to the current rules.